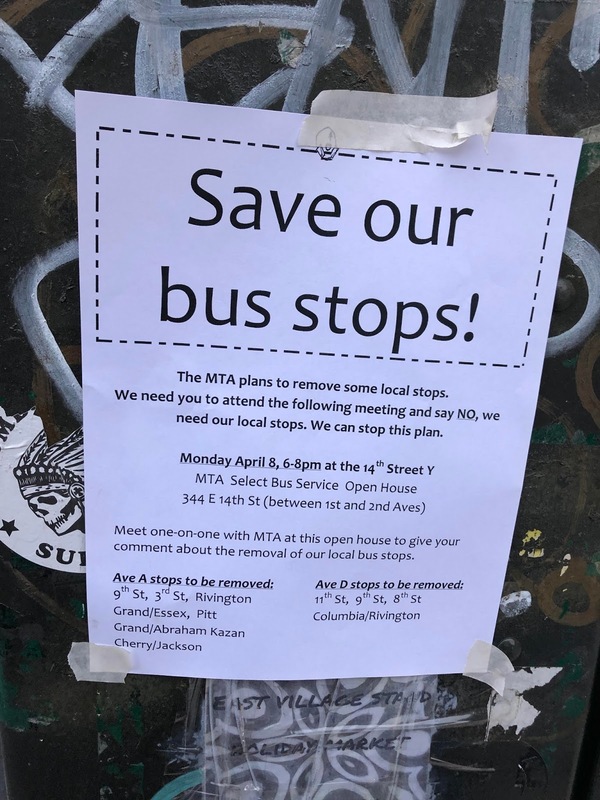 There's an MTA Select Bus Service Open House tonight (April 8) from 6-8 at the 14th St. Y, 344 E. 14th St. between First Avenue and Second Avenue. 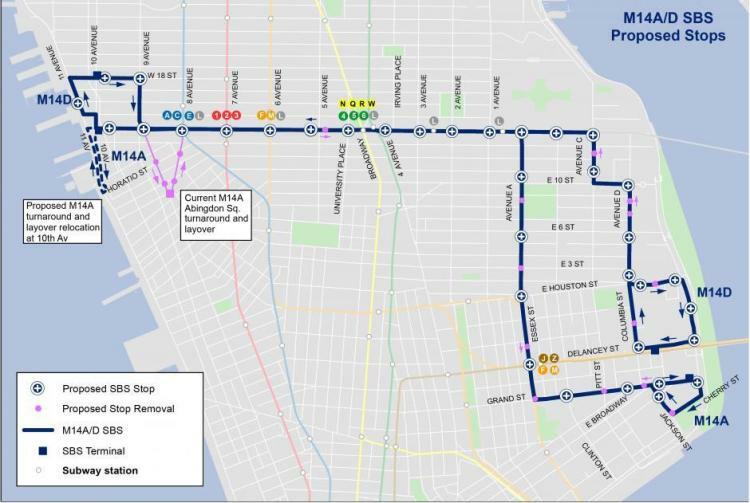 The background: With a new planned SBS route to go into effect ahead of the partial shutdown of the L train later this month, the MTA may eliminate several M14A and M14D stops throughout the East Village and Lower East Side in an effort to speed up service along the bus lines. Hit this link for more on the MTA's plan. As the flyer atop this post shows, there's opposition to the plan ... including an online petition with more than 1,000 signatures here. The meeting tonight is to hear more about the plans and raise any concerns or voice your approval, etc. Makes sense. I take the 14A and it always seemed like a waste to have stops 2, 2 1/2 or 3 blocks apart. If the aim is to speed up service, why do they bother to have any stops at all? Way too many stops, the plan makes sense. Taking the bus is painfully slow, anything to help is a good idea. @8:25am: That is the meaning of LOCAL SERVICE. If you haven't ever noticed, EVERY bus route that's local stops every 2 or so blocks. Then the MTA might as well get rid of buses entirely and tell us to walk or take a cab. If I am tired, or it's late, or bad weather, or I'm carrying some heavy bags I DO NOT want to walk another 2-3 blocks just b/c the MTA doesn't know how to run bus service properly. "Service" - someone at the MTA should look up the meaning of the word! The stops are one block apart crosstown, which is four blocks apart up and downtown. More then that is unnecessary. The whole point of a local bus is to make frequent stops. Try being elderly or handicapped or dragging little kids 14 blocks between select bus stops. The shortsightedness of removing these stops is astounding. The M15 runs local and select service in tandem and it seems to work great. No reason not to do it with the M14, especially since Ave A is that much further from trains. @10:18, where on the above map would one have to schlep 14 blocks between stops? @10:08 I believe that 10:18 replying to the comment directly above them, which said they think 4 bucks between stops is plenty., which it is not. The whole reason the MTA makes the busses wheelchair accessible and are adding elevators to subway stations is to make mass transit more accessible to the elderly and handicapped. Removing stops defeats that purpose. And if you check the SBS bus on 1st and 2nd Avenues, there are in fact exact;y 14 blocks between stops. from 14th Street to Houston Street, so the MTA has spaced bus stops up to 3/4s of a mile apart in the past. Good forbid you miss your stop and end up having to walk all the way back. Also, watch out for where the MTA locates the local bus stops. which they separate from SBS stops, making it impossible for many to catch one type of bus if they are standing at the other stop. Previously, both local and limited busses used the same stop, so in cold, hot or bad weather you could always get on the first bus that comes. Not anymore. You would think they would have solved this problem by now, but its just getting worse as more SBS routes roll out. @Billsville, that's disingenuous, as there are both local and SBS routes on those avenues, as previously mentioned. No one is walking 14 blocks. Could frequency be improved to eliminate huge waits? Of course. 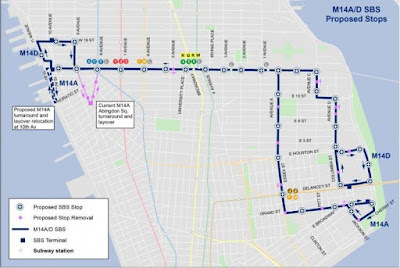 As for the 14A/D proposals, if someone is disabled enough so that a 2 block walk in either direction is cumbersome, they need to look into the MTA's paratransit offering instead. Bottom line, eliminating some of these stops is a good idea. There is no reason to have a stop at Essex and Rivington when there is one a block away at Delancey. Anyone who rides the 14 buses regularly knows that they need speeding up, badly. @ 2:29 I don’t thnk Billsvile is being disingenuous, but I do think you are being unnecessarily hostile to the facts he stated. He already explaned the 14 blocks issue yet you continue to misconstrue the issue and ignore the concerns many people have, just because some people disagree with you. The SBS on 1st and 2nd avenues have stops that are 14 blocks apart—that’s a fact, and that is ridiculous. The new M14 SBS route has stops that are 4 blocks apart. What you are doing is discrimination against people who cannot run to get to these busses. On both 1st and 2nd Avenues the local busses rarely come compared to the SBS, which come in bunches and leave people stranded at the local stops. The MTA is telling people who need to use these stops to hurry up and wait, and that is unacceptable.